Experience a different kind of off-road adventure with our Sedona Hiking Tour. Lace up your most comfortable shoes for a customized hiking experience. Our local guides will help you experience the best our amazing backcountry trails have to offer. Gear up for your trek with a ride in one of our open-air Pink® Jeep® Wranglers. You can climb aboard at the Pink® Jeep® Tour Plaza in Sedona or we’ll pick you up at your hotel. Your hike will be customized to your interests and physical comfort level. Whichever trail you experience, it will be an unforgettable adventure. Doe Mountain Trail leads to a flat mesa, with an elevation of about 400 feet; you’ll be able to see many of Sedona’s recognizable cliffs, canyons and mountains from this viewpoint. Deadman’s Pass may sound intimidating, but it’s an easy hike for all skill levels and features stunning views. Sense the power of the vortexes on a trail to the Cow Pies, circular rock formations with amazing perspectives of the canyon below. Brins Mesa trail is surrounded by spectacular red rock cliffs and buttes, and crisscrosses a dry creek bed that has a charming appeal for less experienced hikers. As you hike, your Certified Interpretive Guide will share facts about the desert plants, wildlife and topography. 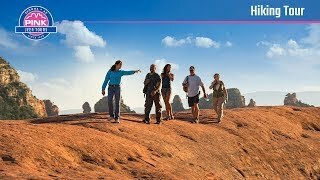 Take The Sedona Hiking Tour, one of the best ways to get out and explore the backcountry trails with the area’s best adventure company: Pink® Jeep® Tours. I will definitely do more Pink Jeep tours in the future. They never let me down. They are extremely educational and lots of FUN! The tour was so much fun. Our guide weaved a variety of history, information, and natural beauty into our trip. The guide made the trip a blast, and the seamless experience of Pink Jeep Tours sealed the deal. We'll be back soon! It was great. Jason quickly assessed our group and we felt he chose a trail that we could manage but also had some challenges. We were a mixed group: 2 seniors, a 40, 10 and 8 year old. Outstanding! Our guide was fabulous - smart, engaging and a great photographer! We learned a ton about the plants and history of the area. The hike was a lot of fun and the drive was just the right amount of bumping. Five stars! Laura was awesome!! The ride was an adventure, the hike just right, the scenery was amazing, and Laura was so fun! She had lots of info on everything and good stories! Wonderful fun pics as well for lasting memories. Thanks Laura!! I was worried that the hike would be too hard as I was getting over a cold, however Charlie balanced the requirements of all the guests really well. Not difficult physically, but some technical bits that were fun and stunning views. I loved it!